It is necessary to keep alternative power source at hand to counter the power outages. The advantage is doubled when the generator of yours is portable and easily mobile. That way you can use the generator in all sorts of occasions and in all sorts of activities. 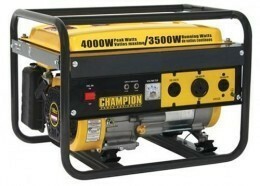 There are many generator in the market claiming to be the perfect portable generator. But I’d suggest you champion Power Equipment 46597 generator and Champion-76533-generator. Now I’m discussing about Champion Power Equipment 46597 RV Ready 4000 watt Generator. For one it has remote start that you can utilize. 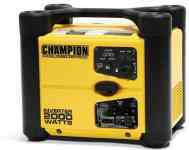 Let us review this model of Champion 4000 Watt generator below to see what advantages it has! The 4000 Watt Generator from Champion Power Equipment 46597 comes with an OHV engine of 196CC and it has Cast Iron Sleeves which enable it to produce 4000 watts of surge units and 3500 watts of steady electricity. The generator has two 120V AC Outlets and a 120V twist lock, a DC Outlet for charging batteries and supports remote start from a distance. You will get Low Oil Shutdown feature and a fuel meter and another volt meter to monitor what your generator is potentially overloading. The generator comes with 8 inch wheels for mobility. This is a fabulous addition to the Champion Power equipment range. You can start off the generator in one go. The generator can be regulated from a distance as well. Thus, you can go on camping, set everything up in your camper van and when the equipment are all plugged in, you just need a touch to regulate the power and enjoy the camping vacation with your family. This is unique to the Champion 46597 Portable Generator. Now people won’t have to guess. They will be able to simply monitor the total hours the generator has run. the fuel meter will tell you how much fuel is left and the volt meter will give you the stats of the steady flowing electricity. The generator gives you adjustment facility as well. You can adjust the performance of champion 4000 watt generator when you see fit. What Can You Run With It? The surge power for this generator is 4000 watts and 3500 watts is the regular power. That means you can run all the major home appliances of yours. It runs for a straight 12 hours at 50% of its load and can power your RV. The generator is good for the fridge, your TV, the Sump Pump and a good number of lights too. It is not like the other Heavy Duty Generators but it still packs the punch when it comes to power. Plus, it produces the noise of 69 dB which means it is way lower than what is considered as dangerous. This generator is as good in camping as it is in backing up the power at your house. You will have the convenience of running it with remote. That means less work for you. It is CARB registered. So, you can use it in as many as 50 states of US. The Warranty of the product is two years which is standard. You will need to allow the generator time to drain the gasoline that it uses. The Champion 4000 Watt Generator Wheel kit is not included as standard depending on how much you pay. 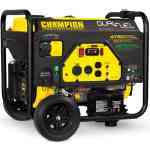 Champion 4000 Watt Generator Dual Fuel is not available on this model. The Champion 4000 Watt Generator can provide you reliable performances. You will have the pleasure to use this portable generator for many things. Buying this generator will definitely be a wise decision on anyone’s part. One thing you could do to further your research that many people do is download and read the Champion 4000 Watt Generator manual, this discusses what is involved in the maintenance and upkeep of the unit. Reading a good portable generator review on your potential list is also essential. Thank Godness! Someone with knowledge speaks!